Many people have heard of the WoodRat system, but far fewer have actually tried it. 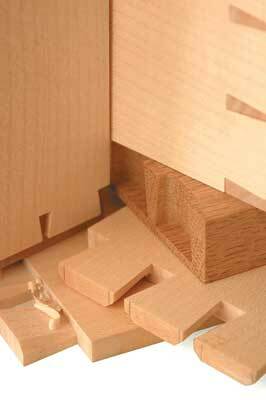 It was conceived some years ago by Martin Godfrey while in search of a foolproof way to make perfect dovetails. The WoodRat is his own laterally thought-out answer to that requirement in a compact, precisely engineered machine that works with most standard routers. However, it does far more than just dovetails, and safely. It is the all-embracing solution to jointmaking, mortise and tenons, housings and a variety of complex joints of all sorts. 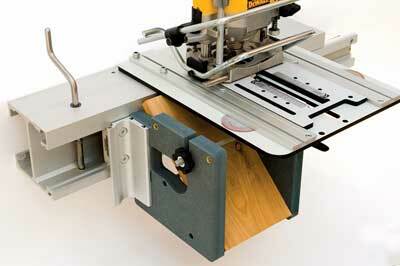 As if that wasn't enough, it can be used to create mouldings, just as you would on a router table. 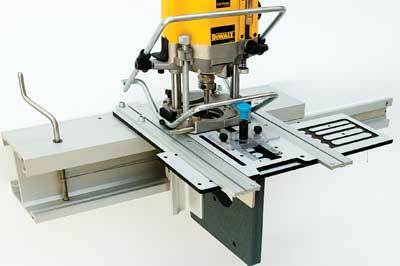 It is one machine that, when making joints, actually allows safe 'climb cutting' - cutting in the wrong direction. There are seven main areas over which the WoodRat can operate. The set-up time between them is short; the slowest can be done in under five minutes. The larger WR900 has two cam lock positions, which makes dovetailing more efficient, but you can also do them on the smaller WR600 model. A chart uses the bit sizes to set the geometry of the joint. A pair of test sticks gives the joint positioning and the fit of pin to tail. The WR900 has two positions for the wood. The piece on the left is marked up with parallelogram and pencil, and shows where the cut is placed for cutting on the right. When the first piece is socketed it becomes the template for the pins in the second piece. Complete flexibility and any work between 7mm and 50mm thick. 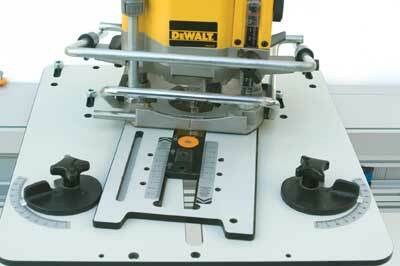 The WR600 has only one cam lock, and marks out the joints on the machine itself or onto the measuring rod. 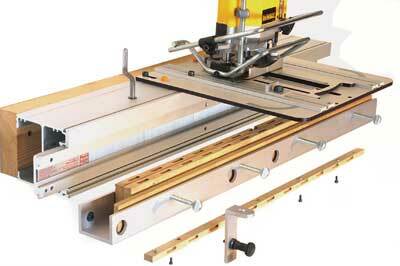 The WR900 uses the same method when working large sections - up to 750mm width of board. These need the MB3 mitrebox. They are first cut at 45° in the joint area and then the dovetail is placed so as to be hidden by the mitring. 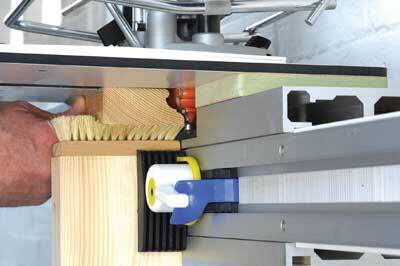 The mitrebox can be used to make the joint with the tails vertical and the pins held horizontally in it. The MR4 allows fast, accurate and repeatable mortise positions. Mortising is achieved with a homemade mortise rail or with the MR4 accessory. There are several ways to mark out the mortise positions. By pencil, you can set your cut. From the pencil marks - for repeat work - you can set pegs to limit the length, and stops on the guide rail above for positioning the opposing mortises on the two stiles of a cupboard door. The mortise rail has a host of other possibilities not touched on here, like tapering, inlaying and also rotating the work, thus creating a router lathe, and working on pieces lying flat directly under the baseplate. The component is held by an adjustable cam clamp. In gallery photo 9, a haunched tenon is being formed. There are two main methods, the easiest being using the block to measure the tenon width. The block will also measure double tenons and the same block will also position double mortises to fit and to measure out distances when batch cutting. The other method is marking out the guide rail and using a pointer on the router plate. 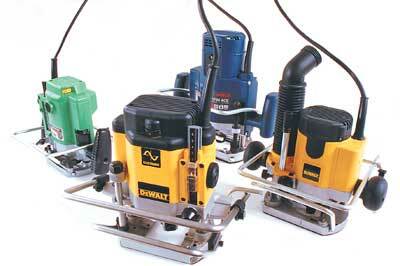 The router will follow a standard or custom template precisely. In gallery image 10, you can see the twist-and-drop follower pin that guides the router cutter. The pathfinder goes against everything that Martin Godfrey has been batting on about with the WoodRat. It is a template system, but what you lose in flexibility you gain in speed. All tenon types are very easy and quick to create. Dovetails are a no-brainer with this system. Lapped dovetails take a little more thought and care, but it will create a 'hand-cut' looking classic drawer in under four minutes - five with the grooves as well. 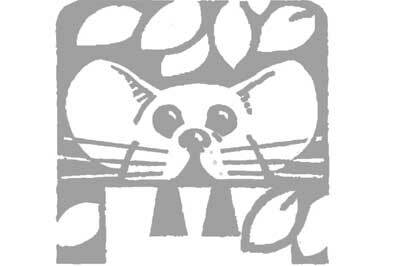 Blank templates are available that can be filled with any shape that you need for a whole variety of things. 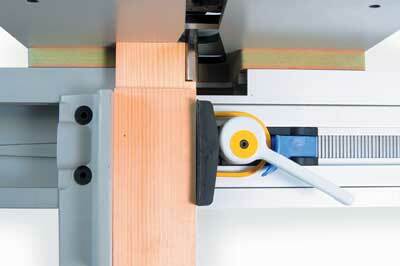 The low-tech brush keeps the workpiece pressed up against the table underside. 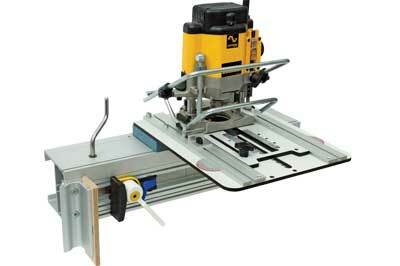 This is directly comparable to work on the router table, with the router accessible and safety built in. 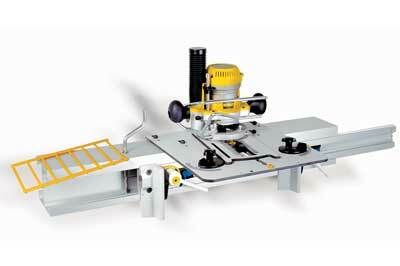 There is nothing that can be done on the router table that cannot be done on the WoodRat according to Martin Godfrey. The operator can easily see their hand positions in relation to the cutter and thus work safely. 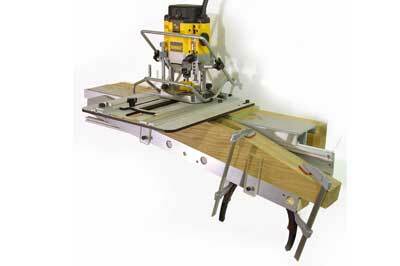 Crosscutting and housing is quick and easy on the WoodRat and just not possible on a router table. 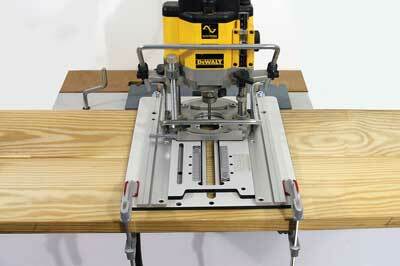 Imagine manoeuvring a big plank across a router table without the cut wandering. Trellises and grilles are made by cutting across the plank at regular pitch and then cutting into strips and planing each piece to the thickness of the width of the joint. 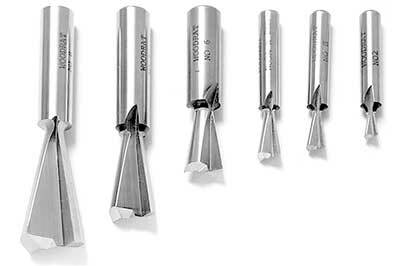 This creates multiple halving joints and a range of interesting projects as a result. This illustration in gallery image 13 shows what is possible by creating a series of joints in one go, all completely matching. This is done by putting a stack of pieces through from left to right, cutting maybe 20 pieces at a time, using a cursor on the router plate to track down a ruler on the guide rail. There is no breakout and the exact fit can be adjusted by angling the ruler. For smaller pieces, you can cut joints in a solid length of wood, and cut into box sides on a bandsaw.